The hospital safety spotlight tends to focus mainly on the well-being of patients. But hospital workers are also at risk for workplace injuries or illnesses. According to Bureau of Labor Statistics, workers in hospitals have a greater risk of injury or illness resulting in days away from work than workers in other industries, including construction or manufacturing. In fact, the rates of some types of injuries like musculoskeletal injuries are much higher in hospitals than in other sectors. According to the Occupational Safety and Health Administration, hospital workers may face specific and unique risks. 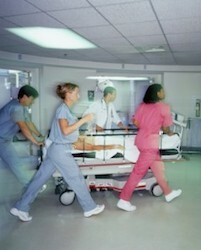 For instance, hospital workers are frequently required to lift, reposition and transfer patients. Those activities may contribute to musculoskeletal injuries. The typical nurse or hospital worker may assist in such lifting, repositioning or transferring of patients with limited mobility several times a day. Hospital workers also face the prospect of injuries and infections from needle sticks, assaults and other hospital violence. Hospital workers may be encouraged to place the safety of patients and others over their own safety. They may not receive the type of safety training that workers in other sectors receive. Safety training in the average hospital tends to focus on the risk of injuries to patients, not workers. Workers may know how to reduce the risk of hospital-acquired infections and slip and fall accidents involving senior patients, when workers themselves may be at significant risk. Hospital work is not routine, and every day brings new patients and new challenges. This makes training workers to reduce and prevent injuries even more challenging. The Occupational Safety and Health Administration recommends that hospitals frequently assess their safety programs, adopt a comprehensive safety and health management system to make safety programs more effective, and establish a comprehensive safe patient handling program.